Home Entertainment Gilson Martins Event, Qual é a Boa, Gilson? 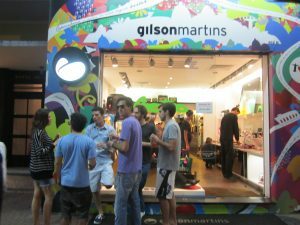 Gilson Martins Event, Qual é a Boa, Gilson? RIO DE JANEIRO, BRAZIL – Gilson Martins, one of Brazil’s and Rio’s most iconic brands has applied its fashion forward thinking to a new event titled ‘Qual é a boa, Gilson?’ (What’s good, Gilson?) scheduled to take place at the Copacabana store on Avenida Atlântica on Saturday, July 21st. The colorful façade of the Gilson Martins storefront in Ipanema, photo provided by Gilson Martins Communication. Starting at 1PM until 8PM, Qual é a boa, Gilson? promises to be a hip social gathering and networking event, as well as an opportunity to meet new friends. During the course of the day, guests will be treated to a variety of musical sets from some of Rio’s up and coming DJs while foreigners and Cariocas can swap valuable information on the city’s many delights over a caipirinha made specially by the team from Leblon Cachaça. As one of the only stores that remained open until 8PM in the late nineties, Martins saw the value of being available to customers, as opposed to the majority of other stores which closed at 4PM on Saturdays. Martins understood that the weekend was a time for relaxing and having fun and so he honored this by bringing in DJs to play sets at the store, creating a party atmosphere that befitted a weekend in the Cidade Maravilhosa. 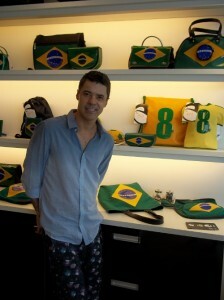 Gilson Martins with the Brazilian flag line of bags and accessories, photo by Felicity Clarke. Gilson Martins first exploded on to Rio’s fashion scene in the early 90’s with his famous bags’ and purses designed to represent specific landmarks in Rio such as the Pão de Açúcar (sugarloaf mountain) or emblazoned with the Brazilian flag and other recognizable motifs. Since then, his innovative nature has inspired him to find new things to do such as bringing the people of Rio together and most importantly, having fun. This is not the first event Martins has hosted at one of his stores. In April, the designer and artist threw a party at his Ipanema shop on Visconde de Piraja to celebrate the sustainability and environmentally conscious designs that the Gilson Martins brand upholds. The event also served to introduce the concept of Qual e a boa, Gilson? which Martins hopes to make a regular monthly occurrence. To join in the event on Saturday, July 21st, head to the Gilson Martins store located on the beachfront of Copacabana on Avenida Atlântica, 1998 from 1PM until 8PM.